A little while ago I wrote about Footy Math’s idea that the AFL could be split into three divisions and said that if they did it geographically, it wouldn’t be great. You agreed with me because you don’t want to see the same teams dominate the league. Then I said a better way to split the league would be to split it by ladder position of the previous year. You were shocked and amazed and wanted to know more. Your wish is my command. Please note that is it nearly impossible (at least in real life) to have a perfectly balanced league because if every team won half their games, there would be no top team. The AFL is set up to take care of this, though, since they have the ‘points for/points against’ system meaning they can strive for a perfectly balanced league and still have a winner. You will also need to know the uncertainty of outcome hypothesis (UOH): the idea that sports fans prefer close games, where there is not a dominant team; fans do not want to know who will win; interest in the game will be higher if the teams are similar in quality. I will try to make this a short post because I know that the world has a short attention span so here goes. Each club would play those in their division twice, and every other club once. This results in a 22 game season over 23 weeks (including BYE). There is one glaring problem with this method: it’s inconsistent. The divisions change every year so there could be fewer rivalries and frustrated fans who don’t want to keep up with new divisions every year. However, since the AFL had no clear way for structuring the fixture in previous years, I don’t see why fans even have to know about it – just execute it. They won’t even know that was your plan. Fans of top clubs could also be frustrated at the increased difficulty for getting into the top 8. Another possible issue is this could result in clubs of lower quality ending up in the top 8 while teams of higher quality do not make the cut. But that’s also the beauty of it! It balances the competition! 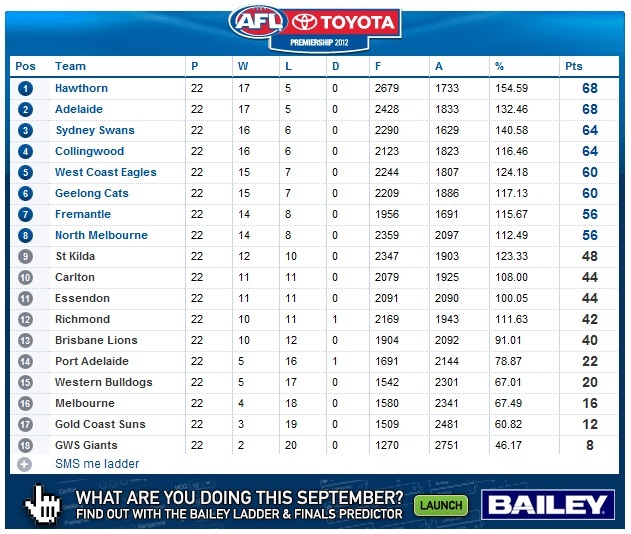 Think of it this way: if the league were perfectly balanced, then the ladder would flip each year (that would mean in 2013 GWS would finish on top with Hawthorn at the bottom). This doesn’t happen. But by dividing it by quality, the league gives lower quality clubs a better chance at reaching the top and makes it more challenging for high quality clubs to stay there, which is what you want in a competitively balanced league. The fans would like it because there is more competition – fans of clubs like Gold Coast and GWS would be excited to see more games there club could win and those in the top and middle would be nervous about competition but it would ultimately peak their interest leading to increased attendance and, therefore, revenue and profit. This idea is consistent with the UOH (which, by the way, I really want to study for the AFL – it’s outrageously interesting). Being divided by quality means there is more uncertainty surrounding the game which entices fans. I, for instance, would be much more likely to go to a game between Gold Coast and Melbourne, than I would be to go to a game between Hawthorne and GWS – I know who is going to win that one and that’s not fun. Maybe I will run some statistics on this and show you how it plays out – is anyone interested? No? Just me? Fine. I’ll do it any way. But I’d love to hear your thoughts. Am I just completely off my head? Have I lost my mind? Do you think this system will work and, if not, do you have any suggestions? ← Best Of The Week: 26 January 2013.